The norfox Young People’s Theatre Company is the Library Theatre’s resident theatre company for young people aged between 15-18, designed to give them valuable experience in developing their skills in a professional theatre environment. 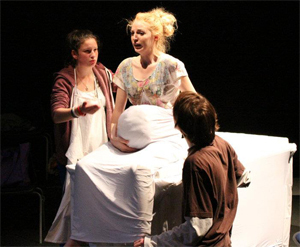 As the Library Theatre is in-between homes, this performance was hosted at the Manchester Metropolitan University’s Capitol Theatre, a performance space for students on their acting courses within the Faculty of Art and Design. The plot attempts to consider what would happen if a baby from skankton were to take over a city. It starts with Mrs Mungus who, after a two and a half year pregnancy, gives birth to Hugh Mungus - a monster baby with an accelerated growth rate and insatiable appetite for anything that moves! Dastardly military scientists set their hearts on cloning an army of supersize babies for mischievous ends from Hugh Mungus who shakes off his chains and stages a daring escape. 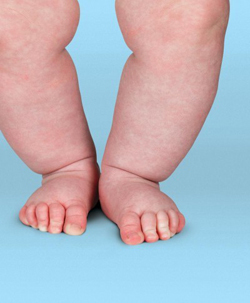 We are encouraged to consider who or what can stop this oversized freak of nature, whether the military are the good guys or monsters themselves, and drawn into wondering what the fate of the oversized baby should be. The norfox have a difficult task of trying to nurture the writing, acting and production skills of a young and developing group of teenagers who are experimenting through the theatre. And this production certainly had all the trappings of a well-crafted theatre performance, with some clever choreography, but lacked the clincher of an engaging script to tell a convincing story through. The exploration of that tension between the generations and trying to grasp the moments and determinants involved in growing from children (well rapidly growing baby) into adulthood is a storyline that will be worked and reworked with each new generation. It's not an easy one to grasp from the vantage point of young people, and this play fails to grasp anything particularly useful or insight from what I could see. I do add the caveat that I didn't spot anything particularly insightful or incisive, as I could quite easily have missed it, as the play moved through its scenes with a pace that was quite extraordinary, with prop changes seemingly whenever they could be added. Quite what led to such a fast pace of a play I'm not too sure - it may have been driven by the teenagers acting in it, or it could have been an attempt by the adults around to keep the pace and tempo going to cover for the lack of depth in the script - I'm not quite sure, but I don't feel that it added anything to my experience. Notable, was the dramatic use of some spunkie numbers from an era when there really was something of a youth culture, which did fit the pace very well. The musical backdrop indicates a much older influence behind the scenes in the production, so why couldn't that have been brought to bear in tightening up the story to have more purpose and structure? From the expressions of those involved in the acting, I'm quite sure that everyone was exhilarated by the whole experience, which will also have been extremely rewarding, educational and insightful. When I was a teenager, I wet to a drama school event in my summer holidays which I got a tremendous amount out of, so can imagine a professional setup like this will be a stunningly terrific experience for those involved. 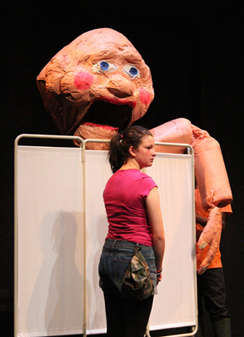 The papier maché giant baby puppet made by local puppeteer and performance artist Ben Moores, of Just Add Water Theatre Company, was a giggle for sure and very well manoeuvred through the changing scenes. And as the cast included several deaf people, with some voice over work on occasion, and it all being signed for the audience, it was a testament to the ingenuity of the performers and directors to be able to pull it all together so elegantly. The actual birth of Hugh Mungus was both a joy because of the slap-stick and unreal character of giving birth to a monster, but also because of the relatively slick delivery of it, if you forgive the pun. The representation of the emergent monster through the use of tentacles coming from the mother to almost touching the audience was really quite evocative and unnerving, and provided the best point of contact with the central focus of the story. Alas, the point of connection wasn't maintained and the storyline drifted, then raced to begin its climax. The problem with the ending though was that the audience weren't really sure if the story had come to a proper conclusion. After the stage was cleared of actors and a stunned silence filled the space, with hesitation, the audience applauded. I knew that there was some great direction, choreography and fairly well drilled performances I wanted to applaud, but I was a little unsure what I'd just witnessed to be honest. As Carl Grose is not a new or unaccomplished writer, and indeed actor, I am left wondering if his script was driven by the performers, but for whatever reason the production as a whole lacked body and soul for me, or at least a story I understood. I know the Library Theatre is juggling many balls at the moment, and the young people seemed to get a lot out of their activity on stage, in the theatre the audience is what it's about and this just didn't deliver a performance sufficiently worthy of a wider one. Editor's Note: Are the Arts having a renaissance? Well if you want to discuss this particular topic you should come along to the Manchester Salon on Monday 10 September and join in trying to answer the interminable question of how we contemplate art today.